Two and half years in the making and created almost entirely by the Institute for Sustainable Design and The Irwin S. Chanin School of Architecture faculty, staff, alumni and students, the acclaimed new exhibition Lessons from Modernism: Environmental Design Considerations in 20th Century Architecture (1925 to 1970) opens on January 29th in the Arthur A. Houghton Jr. Gallery. 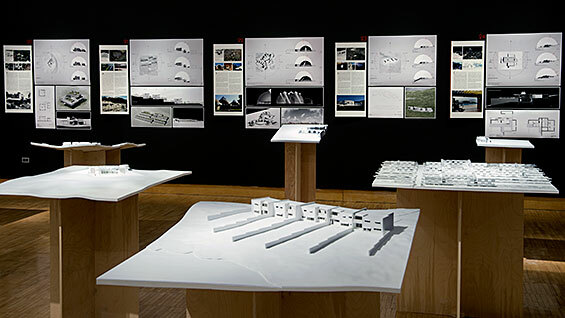 Approachable enough for a novice interested in architecture yet holding new insights for professionals and scholars the exhibition seeks to upend entrenched notions of architecture's Modernist era as disconnected from contemporary values of sustainability and environmental consciousness. Its inspiration? "The 21st century and the dilemmas we are facing," Kevin Bone, Director of the ISD, Professor at the School of Architecture, and a principal on the project says. 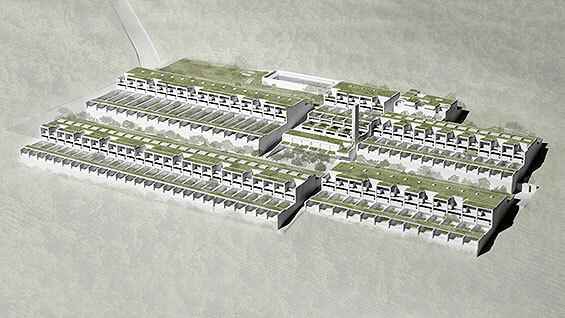 "We wanted to challenge the perception in certain architectural camps that sustainability is something you call a consultant to help you on by recognizing there was a time when these environmental relationships were integral to the architectural idea." To do that a core group of faculty, staff and alumni from the School of Architecture winnowed a list of over 100 projects from the Modernist era down to 25 examples. These incorporate both well-known and less well-known works across a range of building types including houses, schools and mixed-use facilities in a diversity of climate zones. In each case the research team looked for architects that had been on record discussing their ideas about the work's relationship to natural phenomena. "We wanted someone who is not necessarily an architect to be able to come in here and understand the content we are trying to put forward" Prof. Bone says. A visitor to the gallery would first be treated along the hallway to a row of black and white photographs of each building presented as "artistic impressions," Prof. Bone says. Entering the gallery, visitors will see scale models of all 25 projects filling the space of the room. Mounted waist-high on separate "kiosks" and finished a uniform bone white, the models make a bold presentation as they invite close examination of each building's every detail. Contextualizing information covers the walls. A panel on each project includes its history, a basic study of each building's relationship to the sun and an investigation of the building's particular interaction with the environment through landscaping or construction. A locator map puts the buildings in relationship to each other on the globe and in their related climate zones. A general timeline puts the 25 selections relative to other 20th century architectural masterworks that were considered but not included. "It has been something of a monumental undertaking," Prof. Bone says. All the models, research, drawings and photographic material have been produced exclusively for this exhibition, with generous support from the Stavros Niarchos Foundation. But the engine making it possible has been collaboration by faculty, alumni and students at the school. For example Wes Rozen ('05) of Situ Studio did the computer numeric modeling for the landscapes. Builder of Scale, a model-making studio run by Dan Schillberg ('03) built two of the models, and recent graduate Daniel Wills ('12) spearheaded a summer-long model making effort in 2012 conducted by students at the school. "This group of staff, alumni and students of the School of Architecture have contributed their time and worked very hard to make this exhibition possible," Prof. Bone says. During a preview visit we asked Prof. Bone to select a few favorites. Immediately he maneuvers over to the model of what appears to be a modest Japanese pagoda. His hands hover over it. "This is an amazing one which I didn't really know before we did this show. Antonin Raymond, who went to Japan to help Frank Lloyd Wright build the Imperial Hotel, developed this project called the Kuruizawa Summer House and Studio (see above) in a sub-tropical, humid landscape in Japan. He adapted an iconic section from Le Corbusier's work for a house in Chile, a project proposed in stone and concrete, a material pallet appropriate for that region. Raymond took aspects of the same spatial diagram that appeared in Corbusier's drawing but through a different strategy of materiality and envelope made this appropriate for a different climate and a different cultural setting. This all-wood house with a thatched roof uses locally sourced materials and the vernacular of Japanese wood construction to create a system of passive ventilation controls for managing comfort. For example, the winds that rise up the hill waft over a cooling pool fed by a spring and then lift up over the high point of the house, acting as a natural evaporative cooler." Prof. Bone points out other notable works such as Johannes Duiker's Open Air School for the Healthy Child (1930, at right), an early work of Modernism built in The Netherlands. A multi-story building, for every indoor classroom an adjoining outdoor space was also built, facing the direction of the winter sun for use year round. Another example, a single-story luxury home from the Greek Isles kept comfortable without mechanical equipment, has local connections. The architect, Constantinos Decavallas, co-founded the Form and Climate Research Group at Columbia University while a graduate student there in the 1950s, predating "green design" by almost 40 years. A corrective to misperceptions could not be more enjoyable or edifying than a visit to Lessons from Modernism. 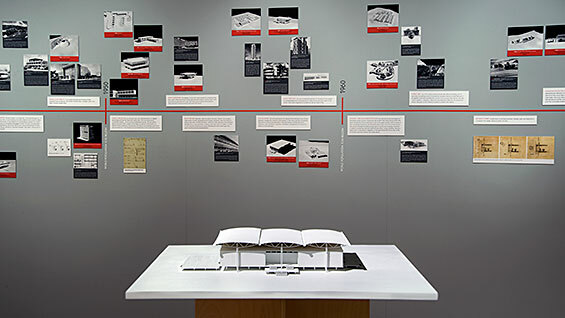 Through original research presented in all new drawings, photos and models an alternative reading emerges about Modernist architecture, one of the most examined and seemingly codified cultural movements of the last 100 years. Refining a huge amount of collaborative work down to accessible, thought-provoking demonstrations, the exhibition shows visitors that the relationship of buildings to their environment was much on the mind of 20th century architects long before there was ever a LEED certification. "It is also a reminder that very good architectural work can be made with an element of simplicity," Prof. Bone says, "Here are architectural masterpieces attuned to the environment and that are relatively modest." For more, read the Artinfo interview with Kevin Bone discussing the exhibition.